Expressing your love is never an easy task. Whether you are doing it for the first time or renewing your vows after being in a relationship for years. The best way is to send a romantic love greeting card with a thoughtful message inside. At Canva, you’ll find just the right inspiration for your love greeting card which you can create under minutes with our intuitive design tools. You don’t need to be a design wizard to create a Canva because we have a large number of ready-to-use romantic card layouts. All you have to do is browse through the professionally designed love card layouts, choose the one you feel best mirrors your feelings, and download it. Simple, isn’t it? The best part – It’s all free. Create a new Canva account to get started with your own love greeting card. Choose from our library, hundreds of professionally designed templates. Fix your pictures, add stunning filters and edit text. Change the images. Upload your images or choose from our stock library of over 1 million photographs, graphics, and illustrations. Change the background. Pick a background from our library or use an image. 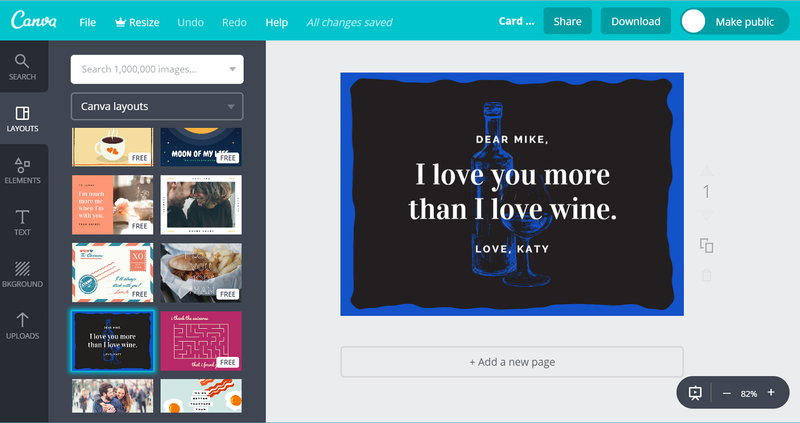 With Canva as your design companion, you can craft a personalized card for your partner. You can add a picture of your favorite memory together or even a beautiful collage. Canva gives you the freedom to customize your card any which way you want. By clicking on the green ‘Upload your own image’ tab, you can upload as many pictures as you want from your computer and add them to your card. Use the grid and frame tool to place the images correctly on the card. You can also crop, resize and filter the uploaded images making the whole design look flawless. From glittery to vintage, classy to bold, our designers have created card templates for every mood. Select the one which best reflects your love for your partner and either download it as it is or tweak the design to the extent you prefer. If you have something special to say, you can edit the text in the card and replace it with something original. Add soul to your words by using lovely fonts from Canva’s collection of 130 fresh fonts. We also have pre-designed font combinations and typography ready to go. Surprise your lover with a beautiful personalized card on your anniversary, Valentine’s Day or just because you want to remind them how much you love them. With Canva you have the option to print your card in professional quality and hand it over or mail them. The 300 DPI (dots per inch) file ensures that images on the card don’t blur or pixelate when you get a print. You also have the option to post your card on social media platforms like Facebook and Twitter, directly through Canva. You can even download the card in JPG format and forward it as an image on Whatsapp or Viber. No matter the distance, Canva will transport your love instantly! What’s the first thing I should do to get started with my card design on Canva? The first step to create a design on Canva is to create an account, which will help you save your work, edit it at a later date and share it directly on various online platforms. Can I find any romantic visual elements like flowers or hearts for my card on Canva? Canva’s media library has over a million images, vectors, and illustrations for you to choose. Using the search bar, you can easily find relevant elements. Most of these images are free, while only a few cost as little as $1. Can I change the background of the selected card layout? You can edit the design available on Canva to the extent you want. Font style, color, image, and background, all of that can be changed easily using Canva’s drag-and-drop interface. As for the background change, you can find many free options under the background tab. While the premium ones are available at $1, each for one-time use.